HODEIDA, YEMEN — In Yemen’s Hodeida province, fishing is no longer the main activity practiced by most residents, instead, the hunt for civilians trapped under the rubble of structures destroyed by Saudi-led coalition airstrikes, using U.S. weapons, has come to take people’s time. “I was driving my cousin’s son who was injured at the fish market when I reached the al-Thawrah hospital, another raid hit us”, recalled one resident – a motorcycle driver who lost one of his limbs in the attack. A number of motorcycle drivers were killed and wounded by an airstrike on a motorcycle-park near the hospital. One 19-year-old victim of the bombing recalled the unexpected nature of the attack, “we were transporting fish to the central refrigerator in the area when warplanes suddenly bombed us. Two of my brothers were killed,” he said, lying in torn, blood-stained clothes on a bed in the Hodeida Hospital’s emergency room. The death toll is expected to rise due to the magnitude of the airstrikes, particularly on the hospital. Ambulances were unable to transport the wounded to Sana’a or other provinces as they too were targeted by aerial strikes. One ambulance was destroyed in Al-Marwa while attempting to transport the injured to Sanaa. Al-Thawrah hospital, already crowded with a number of wounded from previous airstrikes, has launched an urgent appeal for Yemeni citizens to donate blood. Moreover, The U.S. backed, Saudi-led coalition’s blockade of Yemen has prevented medicine and other critical commodities from reaching around 8.4 million people, many of whom are believed to be on the verge of starvation. The bombing of the fish market and hospital were amongst the tens of massive attacks that targeted civilians this week, On Monday, four fishing boats were targeted off of Hodeida’s coast inside of Yemen’s territorial waters, killing multiple fishermen according to a statement by Yemen’s General Authority for Marine Fisheries in the Red Sea. On Friday, Saudi-led coalition warplanes conducted two airstrikes on a fishing dock. According to Yemen’s General Authority for Marine Fisheries in the Red Sea, Saudi airstrikes killed 28 fishermen in three attacks on Yemen`s Hodeida in the past three days alone. On Wednesday, Yemen’s Houthis (Ansar Allah) suspended retaliatory attacks against Saudi-led coalition forces in the Red Sea in response to regional and international efforts to bring peace to Yemen. The Saudi-led coalition claims the Houthis are using Hodeida as a base to attack oil tankers. A source in the Ministry of Foreign Affairs based in Sana`a said in a statement that the coalition’s recent attacks send a clear message to the international community, demonstrating which party is blocking the peace process in Yemen. Thousands of Yemenis staged a mass rally in the capital Sana’a, Friday, to condemn the Saudi-led coalition’s offensive against Hodeida. Expressing their anger at what they called Saudi Arabia’s war crimes in Yemen, participants vowed to defend their country by any means necessary. Tens of thousands of Yemenis in Sanaa protest following coalition airstrikes on Hodeidah. The attack against Hodeida has put thousands of children at risk of death, starvation, and disease. According to Save the Children, around 6,000 people – half of them children — are leaving the US-Saudi-led war-ravaged city every day, bringing the total number of people forced out of the city since the start of the offensive in June to more than 330,000. Al-Malaki didn’t provide any evidence to back his claims. 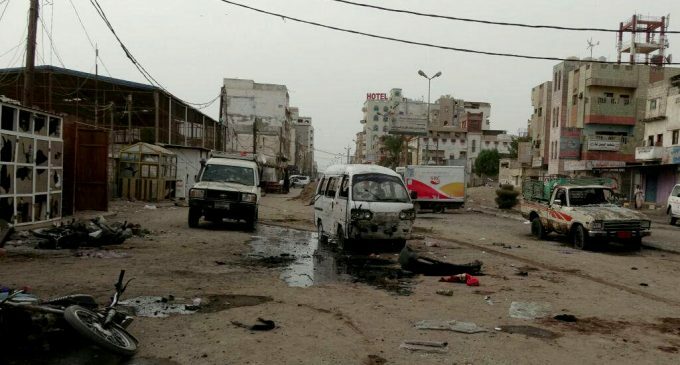 The post Saudi Coalition Bombs Fish Market & Hospital in Hodeida Killing Scores of Civilians appeared first on MintPress News.